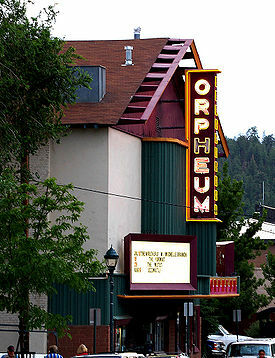 The Orpheum Theater is an old movie house in Flagstaff, Arizona, originally named the Majestic Opera House. The building was constructed in 1911. It was rebuilt and expanded in 1917, and renamed the Orpheum. The theater closed in 1999. Three years later, in 2002, it reopened as a concert venue. It is owned by Chris Scully and Charles Smith. ^ "Orpheum Theater History." Orpheum Theater. Retrieved on July 14, 2007. ^ Orpheum Theater Venue History." Retrieved on August 23, 2016. ^ Hendricks, Larry. "A Century of Life: The Orpheum Theater garners community support to keep Flagstaff entertained". Arizona Daily Sun. Retrieved 2017-07-31. This page was last edited on 16 December 2017, at 00:02 (UTC).